Front Markings Shimano [Golden Arrow] Back Markings Shimano Forged 170 Japan on crank arm, VIA and FC-S125 on spider arms. One of three variations of the Shimano 105 Golden Arrow crankset. This is the two piece "calking" crankset. The drive side crank was made from two seperate pieces, the crank arm being fit to the spider. One of the photos in listing shows that these two pieces were indeed seperate pieces. There was also a one-piece constructed version of this smooth style crank, model number FC-S105. 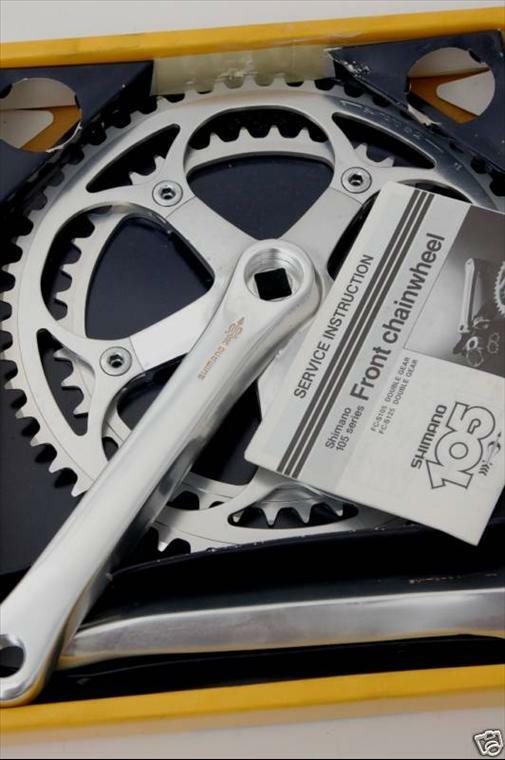 The other version has some fluting on crank & spider, model number currently unknown, however it has a striking similarity in appearance to the FC-6200 crankset. Cold Forged crank arms, came stock with a 52/42 set of chain rings. Orginal spec BB was the BB-3P11 for english threading, BB-5N11 for italian. The catalog (on velo-pages.com) gives the BB as 32-52-35 i.e. 119mm with 3mm overhang, so the modern symmetrical equivalent BB is 122mm.